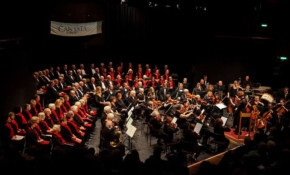 It’s a challenge for any choir to sustain the emotional range and intensity demanded by this work by Karl Jenkins, however, Cantata Choir rose to the challenge well, with barely a hesitation, accompanied by the excellent Symphony Orchestra. A stalwart Samaritans volunteer will be heading to the prestigious party at the Palace after being nominated for his commitment and dedication to volunteering by the Isle of Wight branch. As a special treat for Isle of Wight audiences Susanna has agreed to perform a special preview of songs she'll be performing in the prestigious John Kerr Award for English Song competition. The Ventnor Winter Gardens has teamed up with the Isle of Wight Samaritans to work together and provide help for people in distress or despair in the Isle of Wight. On Sunday 1st October around 50 intrepid swimmers will be braving the waters of the Solent to take part in the Isle of Wight Samaritans’ annual sponsored Solent Swim. St. Catherine’s Church was packed to capacity when Orpheus Singers joined with City Chorus from London for their grand finale for the season concert.